Like any other reputed and acclaimed language of the world, Urdu also has a rich and elegant literature that contains almost all the genres of literature that are expected of a well established language. 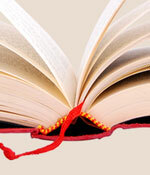 Out of the several genres of Urdu literature, Urdu poetry is the most acclaimed and traditional form. 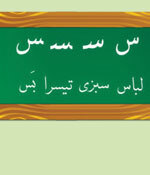 It is the most widely read and adored form of Urdu literature worldwide. As far as the history of Urdu poetry is concerned no fix date can be given pertaining to when the first verse of Urdu poetry was said, neither can any specific poet be attributed with the title of being the first Urdu poet. However, as far as the inspiration for Urdu poetry is concerned, it is dated as back as in the times of Kabir (1440-1518 CE) and Amir Khusro (1253-1325 CE). Since then over the centuries the sub-continent region has produced several Urdu poets that established themselves as the best in terms intellect and linguistic use compared to any other poet of any other language. The major Urdu poets include Mir Taqi Meer, Meer Dard, Mirza Ghalib, Allama Muhammad Iqbal, Zauq, Josh, Jigar, Faiz, Firaq and the most recent Faraz. All these poets are considered the greatest of Urdu poets and hold the status of legends among lovers of Urdu poetry. Ghazal- It is primarily in sets of two liner couplets where the verses must strictly follow and end-rhyme scheme. In order for the couplets to be a Ghazal there should be at least five couplets. The couplets of the Ghazal can represent the same or different thought or theme. Nazm- The other renowned form of Urdu poetry is Nazm. It is a free style form of poetry where the poet can use any verse style with various meters and rhyme scheme, however nazm is considered to present a unified idea or philosophy. Rubai- The poetry said in the form of quatrains is called ‘Rubai’ and is considered one of the recognized forms of Urdu poetry. Hamd- This type of poem differentiates itself from other poems as it is written in praise of Allah Almighty. Naat- It is a poem written in praise of Prophet Muhammad (PBUH). Marsiya- It is an elegy written in remembrance of the death of a loved one. The most noteable form of Marsiya is the poems written on the incident of Karbala where Hazrat Imam Hussain (AS) was martyred along with his fellows. Qasida- It is a type of ode written for some benefactor or represents some important event. It can be longer than a Ghazal but the same rhyme rules are applied to it. Qawwali- It is the form of Urdu poetry sang along with musical instruments, primarily in devotional music. Kulliyat- It is also a compilation of poems but is primarily a collection of different kinds of poems. 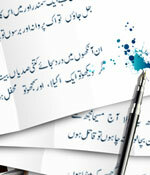 In Urdu poetry the pen names of poets are of great significance. In addition to adding charm to the concluding stanzas of the poems or Ghazals, the pen names symbolize the personality of the poet as well. Urdu poets are very keen when it comes to selecting a pen name for them. It is called ‘Takhaluss’ in Urdu. There are different scripts followed by poets across different areas of Pakistan and India. The Pakistani Urdu poets usually use the Nastaliq calligraphy style which hails from Perso-Arabic script. On the other hand, the Urdu language poets from India use the transliterated form of Perso-Arabic script known as the ‘Devanagri script’. If you wish to learn more about Urdu poetry or Urdu poets then let us take you into the delightful, mesmerizing and enchanting world of Urdu poetry. Simply CLICK HERE to unlock the doors or Urdu poetry.